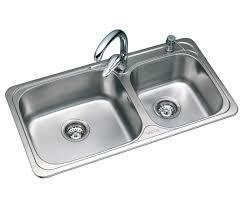 We will remove you old kitchen sink & install your new one. If you've ever tried fitting a kitchen sink before, you'll realise that it takes a bit of forethought and planning. It's not one of the easiest DIY jobs that you can do on your own. Save yourself the inconvenience and allow Darlington Plumbing to quickly and professionally install your new kitchen sink with the minimum disruption to your day. All you need to do is supply some of the materials to carry out the job. The price includes all the pipe work and fittings up to 2 metres away from a water supply.